Researchers at the Leiden Institute of Physics have developed an exciting technique to visualize electrical conductance in sheet-like materials. It shows great promise for devices based on a new family of materials—the ‘Van der Waals materials’. The physicists, who won the 2015 Dutch Vacuum Society prize for their work, present this step forward in the latest issue of Nature’s Scientific Reports. The fascinating properties of graphene—a single layer of carbon atoms—have been widely celebrated. Not only does graphene exhibit remarkable physics, it also shows great promise for new applications, like flexible display screens and solar cells. But scientists aren’t easily satisfied. The next generation of graphene-like materials is already under development. The Leiden physicists place atomically thin layers on top of each other, like a layered cake or ‘spekkoek’. For each layer they use carbon (graphene) or other materials like boron nitride or tungsten disulfide. Since these layers interact by Van der Waals forces, we simply call them Van der Waals materials. First authors Jaap Kautz and Johannes Jobst design their materials layer by layer, enabling them to programme new properties and explore new physics. There is a large interest in using such materials for charge transport research and electronic applications. For that, it is important to understand what determines (or limits) the current flow in Van der Waals materials. The typical experimental approach is to apply electrodes to a sample, send a current and measure the resistance. However, this yields no detail on where the voltages drop. In fact, small-scale variations can strongly affect the conductance properties of the whole sample. Therefore, the research team of Sense Jan van der Molen designed a novel imaging technique that visualizes where the voltage actually drops: low-energy electron potentiometry (LEEP). LEEP is based on LEEM (low-energy electron microscopy)—a microscopy technique that uses ‘slow’ electrons to probe a surface very accurately. The reflection probability of these electrons depends strongly on the exact energy with which they hit a surface. This is due to a quantum mechanical effect: if the incoming electron has the exact same energy as an empty electron state in the Van der Waals material, it will not be reflected, but will get absorbed instead. In fact, the reflectivity turns out to be so sensitive that local potential (voltage) variations can be detected. This is because an incoming electron’s energy depends precisely on the potential at a particular spot. If the potential is negative, the incoming electrons are decelerated and land with lower energy. If the potential is positive, they are accelerated. So if you apply a voltage over a Van der Waals material via two electrodes—meaning that the electrical potential changes with distance—there should be a variation in the local reflectivity. 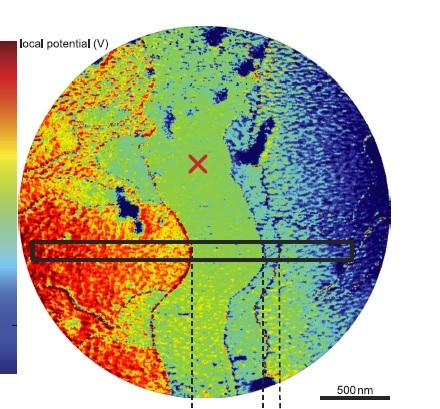 By accurately measuring the reflectivity for each point on a sample, researchers can determine the local potential (voltage) on the nanoscale. The Leiden team has now demonstrated this promising new technique on arguably the simplest Van der Waals material possible. Kautz and Jobst applied it to electrically contacted stacks of graphene layers (1-3 layers). This allowed them to study the difference in conductance properties between single and triple layer graphene. They expect an extension to other Van der Waals materials to be straightforward. LEEP will also allow research on dynamic effects, for example as a function of temperature, since it is much faster than other potentiometry techniques. That creates opportunities for studying metal-insulator transitions, edge channels in topological insulators and ballistic charge transport in graphene. The latter might form the basis of a whole new line of graphene electronics. Jobst recently received a Veni grant to explore this exciting new direction. Earlier this year, Jaap Kautz and Johannes Jobst were awarded the 2015 Nevac prize, from the Dutch Vacuum Society, for their research. "Low-Energy Electron Potentiometry: Contactless Imaging of Charge Transport on the Nanoscale" J. Kautz* & J. Jobst*, C. Sorger, R. M. Tromp, H. B. Weber, S. J. van der Molen. Scientific Reports 5, 13604 (2015). Click here for the link to the article. (a) & (b) With LEEM, the whole sample is at the same potential, which determines the electron energy and wavelength. (c) With LEEP, a voltage is applied with two electrodes, giving each spot a different local potential, depending on its distance to the left electrode. 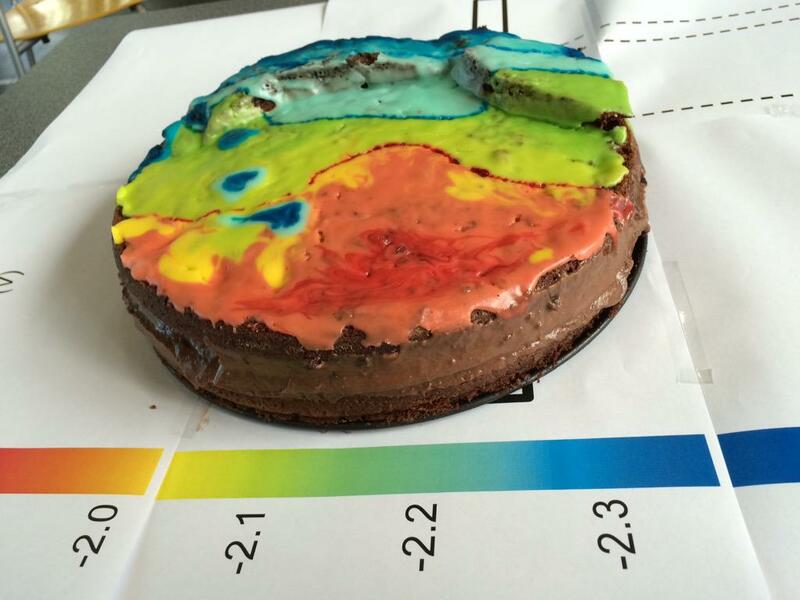 Art and science combined: Johannes Jobst made the LEEP potential map into a cake! Using LEEP, the Leiden physicists measure the local conductivity of a sample by looking how waves of changing contrast move through the field of view. This video stems from the published article in Nature’s Scientific Report.